Top: Golden Raw Silk Blouse features alluring and sweet embellishments and embroidery accentuates all-over the front and sleeves. Full length sleeves. Sweetheart neckline. Concealed hooks closure back. Dangling beads on hemline. Lining inside. 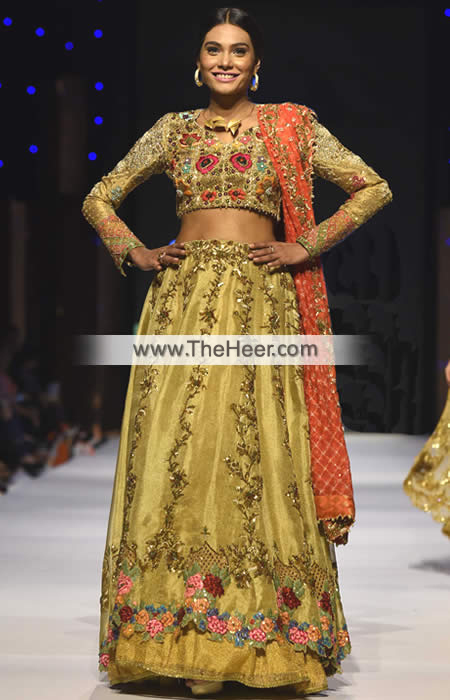 Bottom: Golden Tissue (upper layer) and Fancy Net (under layer) Dual layered lehenga is adorned floral embellishments crafted on bottom and vine-like embellished strips accent the front. Fixed waistband with side zip closure. Lining inside. Under-layer is finished with gotta lace. Dupatta/Veil: Orange Banarasi Crinkle Chiffon Dupatta contains delicate work border on edges. Tiny sized motifs made all-over. Dangling beaded balls on edges. Edges finished. Be the gorgeous bride and make your day awesome with this exquisite bridal lehenga dress. Click the button below to add the BW6540 Golden Orange Raw Silk Tissue Fancy Net Banarasi Crinkle Chiffon Lehenga to your wish list.